Stamped concrete is a beautiful addition for any concrete project. It can be colored, patterned and textured to create a unique look. 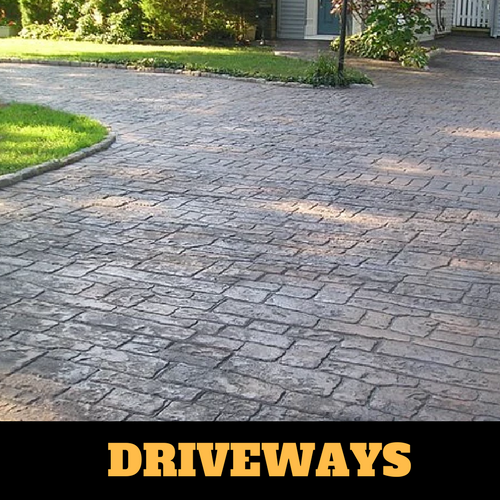 Most commonly used for patios, driveways, sidewalks, pool decks, and interior flooring. Stamped concrete is a more inexpensive alternative to the more authentic materials like stone, brick or slate. So basically you are able to mimic the exact look of a brick road for your driveway or patio, without having to actually lay brick or more expensively pay to have someone lay brick for you. Business owners and homeowners alike are always looking for a more visually aesthetic way to customize their buildings and homes. Stamped concrete can give that eye catching look while remaining the durable and easy to clean surface that you need. 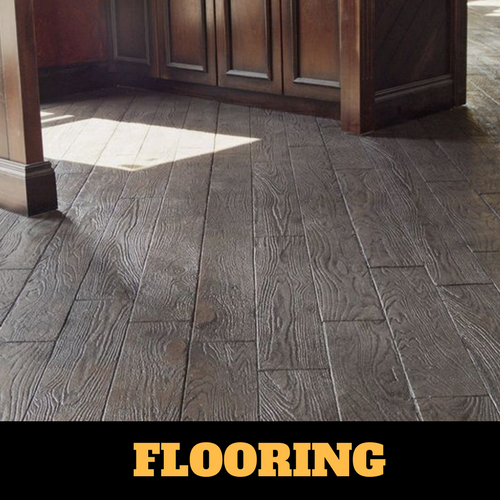 Whether there will only be people walking or heavy machinery driving around, the stamped concrete flooring will be cool to look at and remain strong and crack free for years to come. 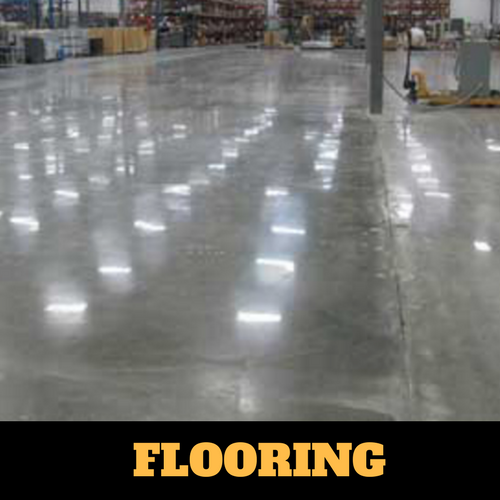 Not many things are able to damage concrete floors. 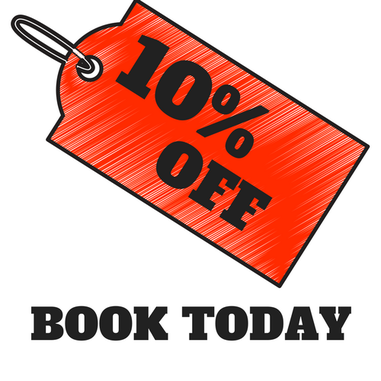 Give your home or business a look of fancy brick, tile or slate while remaining affordable and much easier and quicker to install. We offer a variety of stamped concrete patterns to make your vision a reality, while keeping each design unique and fun! Stamped concrete and decorative concrete can be so versatile , because it’s used for so much more than just your basic concrete walkway. People all over the country have found that it can be used in new fun ways. We can lay stamped concrete anywhere you would lay plain old regular concrete. Such as obvious places like your driveway and sidewalk, or more unheard of places like your very own backyard splash pad. We lay decorative concrete for walkout lanais, and also for simple garage floors. From backyard patios to front porch sitting areas. We’ve seen it all. So if any of these ideas sound good to you or if you want to challenge us with something we’ve never done before, now is the time to call Kalamazoo Stamped Concrete. 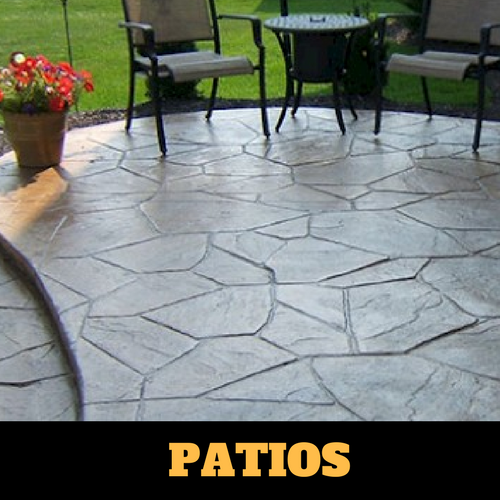 We are available all year long, and are ready to make your stamped and decorative concrete dreams come true! All it takes to set your patio or pool apart is your own creative ideas for adding a stamp or color or both to your concrete project. Outdoor patios are a great way to add another living space to your home. And with our help you can add that space while also giving it a unique look that will make it your new favorite area. Our paving application options can create a one of a kind look. Your inground pool will be the talk of every pool party you throw when you add our stamps you your pool deck. You will love your pool deck design even more when you customize it to match your pool theme or even your personality. Do you want your pool area to feel like a 5 star resort with a crisp clean pattern and color, or maybe you would prefer a romantic Tuscan stone feel. The possibilities are endless! 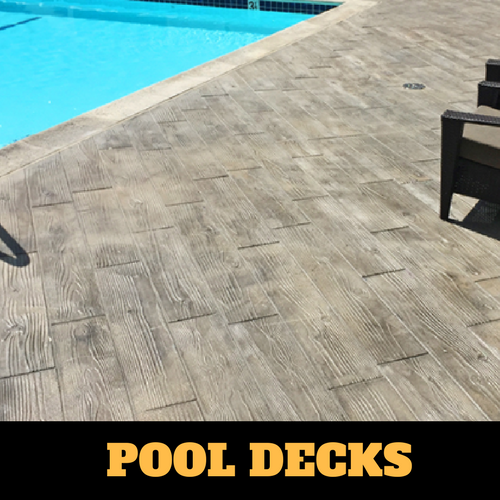 We have also found that stamped or textured concrete is one of the best ideas for around your pool, considering it’s anti-slip properties that put your mind at ease when playing around the pool or when your child inevitably runs from one end to the other. There is virtually no chance of a slip and fall like there would be have you installed a more glossy or shiny material. And when we are texturing, just like with all of our concrete finishing techniques, we are able to customize the patterns and colors to your liking. If your in ground pool needs a little something extra, we are the perfect solution to all your pool decking needs. Since we are already talking about completely transforming your patio or pool deck space into a fabulous at home oasis, now would be a good time to mention our magical fire pit designs that would complete any outdoor living space. Imagine having the perfect pool day with your whole family. As the day winds down, the sun starts setting and there’s a slight chill in the air, you don’t ever want it to end. Guess what, it doesn’t have to. Now imagine starting a nice warm fire, right outside by the pool, where everyone will want to stay just to be able to cozy up by the adorable fireplace with you. It will be like giving your family the gift of serenity when your sitting next to a beautiful and calm water pool, with a warm crackling fire to keep you warm and cozy. It is the absolute perfect way to end a perfect day. With our help the proper design and location will surely add value to your home and also be such a fun place to hang out with family and friends all season long. These fire pits or fireplaces can be added to your initial stamped concrete project or can be added on later to any outdoor area that needs a little extra something. We are also ready and willing to add a stamped seating area around the fire pit or fireplace to complete the area. 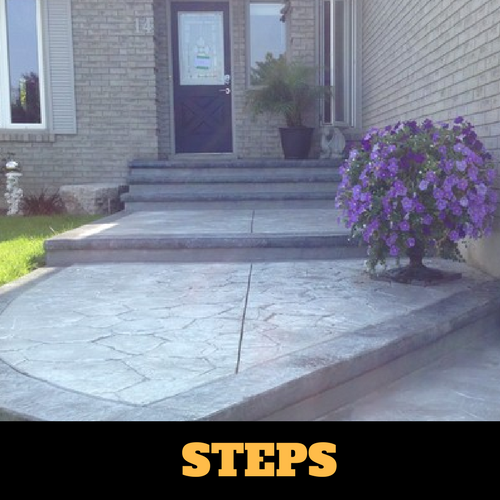 Kalamazoo Stamped Concrete can perform these tasks and more!